They say that laughter is brightest where food is best. In the world we live in today, it’s either we have something that’s good for the economy or something that is good for the people. It’s very rare to have the best of both worlds but the question is, why? Why can’t we have something that benefits the country’s economy as well as the health of the people? Why can’t we have something that will help our farmers as well as our tourism industry? Don’t fret people because the simple answer has arrived in the country with Chef, Author and TV celebrity, Robert Oliver. The New Zealand chef who was brought up in Samoa and Fiji has come to partner up with Women In Business Development (W.I.B.D.I) to link organic farming to the tourism industry. Mr. Oliver has written two award winning cook books highlighting the different tastes of the Pacific. His first cook book ‘Me’a Kai: The Food and Flavours of the South Pacific’ won The Best Cook Book in the World 2012 Gourmand World Cookbook Awards; his other book ‘Mea’ai Samoa: Recipe and Stories from the Heart of Polynesia’ won the Best TV Chef Cookbook in the World 2013 Gourmand World Cookbook Awards. Now Mr. Oliver is here in Samoa to make us proud once more. “When I released the Mea’ai cook book back in 2013, that was to bring attention to the fact that Samoa has awesome cuisine,” he told the Samoa Observer. The close relationship between Mr. Oliver and W.I.B.D.I will lead to so many ground breaking benefits to Samoa. “I have been working with women in business from the beginning on this big vision of linking farmers to tourism industry through the cuisine,” he said. “Samoan cuisine is the joining piece, it links the two together; it is also part of the Samoan destination story as well as holds a development role in regards to keeping money within Samoa. “I previously did a lot of work in the Caribbean with hotels called ‘farm to table’ where I linked local farmers to supply hotels. The initiative from the partnership has grown tremendously since they began their programme. “So we began that in 2013, and that has grown to the point that there are now several hotels and restaurants in Samoa that are being supplied certified organic crops into their menu systems,” he said. “The big asset around organic is that Samoa is the leader in the Pacific (possibly even the world) in that area, and it is the natural Samoan way within a legal framework. “For me it has a great destination value because everyone who travels has to eat, and a lot of those who travel do so because of the food. “Places like Thailand, France and other countries have seen the value of their local food making it a successful form of tourism attraction. 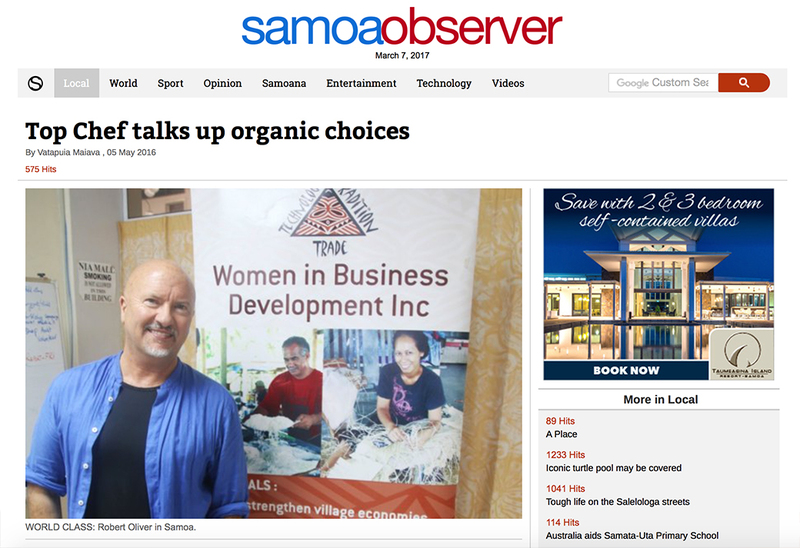 Mr. Oliver believes Samoa should take advantage of the value of organic cuisine. Another reason for Mr. Oliver being in the country is to further develop what he and W.I.B.D.I had started. “I’m back this time because we are moving that to the next level. I will meet some existing clients and checking on the farms as well as re-energize the whole programme. “In the middle of this period Women in Business will have their fundraiser for their warehouse in Nu’u where they have their product development from local Samoan products. Mr. Oliver’s most recent cook book emphasised the importance of organic cuisine which could act as a guideline for many chefs in Samoa. “The Samoan chefs have their own idea of what they want to do, but due to the book we released, they are beginning to understand that Samoan cuisines offers a lot of value to be put on their menus,” he said. “They may not put just palusami but they may put their own interpretation of the local dishes, so my role is to supply the foundation through my books. One thing is clear for Mr. Oliver and that is organic farming is the solution to many problems in the world. “The other flow on effect is the fact that organic farming takes care of all the environmental issues that are coming up globally. The W.I.B.D.I fundraiser will be next week Monday 9 May 2016.